Overview: The Man-Thing is back! Still based out his swamp in the Florida Everglades, the spirit of Ted Sallis still propels the monster forward, as he seeks out human emotion. But make sure to feel some happy thoughts. That last thing you want to do is show fear because whatever knows fear burns at the Man-Thing’s touch! Following the end of the Gerber run, the Man-Thing spent some time in character limbo. He made various guest appearances in other Marvel Comics of the time, some of which are collected in this volume. In late 1979, the Man-Thing once again moved back into his own monthly title. It was initially written by Michael Fleisher, but then Chris Claremont took over during a cross-over with Doctor Strange. This volume of Man-Thing feels more like a “super-hero” comic book, and not a social diatribe. A new supporting character is introduced, John Daltry, who is the local sheriff outside the swamp in Florida. Despite the more traditional approach, the title came to an end with issue #11. And here is an interesting twist to close the book. 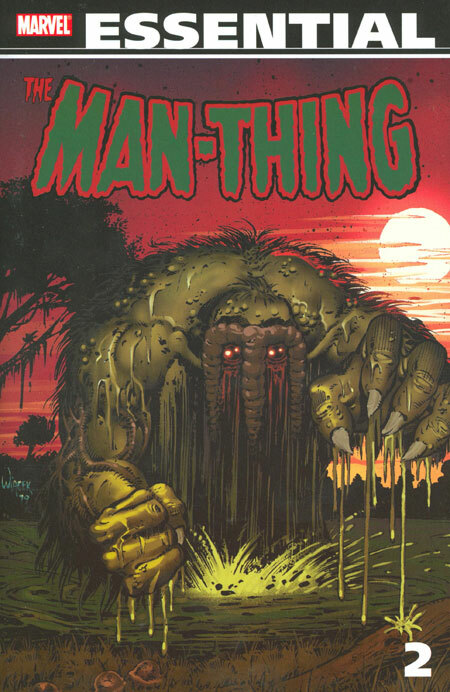 Man-Thing has had two different series with his name on the masthead, and the final issues for both series are contained in this Essential. In Man-Thing #22 (October 1975), writer Steve Gerber writes himself into the story, going on an adventure with Man-Thing to wrap up as many story threads as possible from the last four years. If you have read other works by Gerber, you know that Gerber has no qualms about including himself in the stories – in particular, see my review for Essential Howard the Duck Vol. 1. Now, let’s jump ahead six years. In Man-Thing #11 (July 1981), writer Chris Claremont writes himself into the story, going on an adventure with Man-Thing to wrap up the story threads from the last two years. While Claremont has “appeared” in comics in the past, this is the only time when he was an active participant in the story. If I’m wrong, I trust one of you out there to correct me! What makes this Essential? : This may be an unpopular stance, but I don’t believe these issues are essential. In fact, I would suggest that Man-Thing should never be a title character. He’s great in a back-up or supporting role, but he should not be the star of the book. Now hear me out before you get the rope and look for a tall tree branch. He’s a speechless, mindless character. For writers, you need some kind of supporting characters around him in order to advance the story. Richard Rory and John Daltry just did not work for me in that role. For artists, this is a love/hate character. Sure, you don’t have a detailed costume to replicate panel after panel, but you still have to detail the bulky character with his key facial features. So bottom line, I really believe Man-Thing is best used as a supporting character. His appearances in Marvel Team-Up and Marvel Two-in-One are the highlights of this book for me. Footnotes: Marvel Team-Up #68 is also reprinted in Essential Marvel Team-Up Vol. 3. Marvel Two-in-One #43 is also reprinted in Essential Marvel Two-in-One Vol. 2. Man-Thing #4 and Doctor Strange #41 are also reprinted in Essential Doctor Strange Vol. 4. If you like this volume, try: diving into the back issue bins to find the first 12 issues of Marvel Comics Presents. This was a new anthology title that launched in 1988 as a bi-weekly book. Story arcs would carry over from one issue to the next, and when a story finished, a new character would start a different story in the next issue. Over the first 12 issues, Steve Gerber and Tom Sutton did a Man-Thing story titled Elements of Terror. This has never been collected, so you need to find the back issues. Gerber is back with another Gerber-esque story arc, which touches on the Iran-Contra affair (with the government trying to arm rebels in Doctor Doom’s Latvia), Satanism, and whatever other thoughts happened to be dominating Steve’s mind at the time. Gerber is definitely a unique voice in the world of comics, one that you either get & appreciate, or one that you avoid. It’s taken awhile, but I have grown to enjoy the Gerber stories through readings of his work on Man-Thing, Defenders, and Howard the Duck. This entry was posted in Man-Thing, Marvel Essentials and tagged Chris Claremont, Don Perlin, Ed Hannigan, Jim Mooney, John Byrne, Man-Thing, Michael Fleisher, Steve Gerber. Bookmark the permalink.